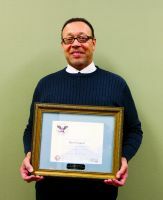 Darryl Clausell, long-time volunteer in the Wheeling area who is the coordinator, Continuing and Community Education at West Virginia Northern Community College, has been designated as a “Drum Major for Service” and honored with the Presidential Volunteer Service Award from President Barack Obama. Cited by the Corporation for National and Community Service after being nominated by Youth Services System Inc., Wheeling, Clausell during the past three years volunteered more than 1,094 hours to Youth Services System and the YSS Safe Place program. According to YSS, Clausell has been instrumental in assisting with site recruitment, community outreach and education and general program support. Because of his outstanding dedication to the local program, he was chosen to serve as the chairperson for the Youth Services System Safe Place Advisory Committee. He also was chosen to represent YSS on the National Safe Place Advisory Board. Last fall, he was instrumental in the planning and implementation of an event to raise money and awareness of runaway homeless youth, the first Wheeling SleepOut. In addition to his work with YSS, Clausell is president of the Upper Ohio Valley NAACP. He is a past chair of the Martin Luther King Committee. He is an active member of the Macedonia Baptist Church, with the choir, as chairman of the finance committee and church treasurer. He also transports youngsters to Sunday school classes every Sunday morning. The Martin Luther King Drum Majors for Service program gives organizations and groups an opportunity to acknowledge and celebrate those volunteers who perform extraordinary everyday acts of service with reliability and commitment, but who seldom receive recognition.